Tim Cook started things off by welcoming the crowd to Apple’s final event of 2014. A few statistics were mentioned, including the successful launch of iPhone 6 and 6 Plus. It has become the biggest iPhone launch in history. The iPhone 6 will also be releasing in China on October 17, 2014. It has already seen unprecedented amounts of demand and is expected to be a successful launch. Apple Pay was briefly mentioned with a short demo and the announcement that 500 additional banks plan to adopt it. Users can begin using Apple Pay at retailers and online on Monday, October 20, 2014. The Apple Watch will be receiving a devkit called WatchKit next month in November, which will allow developers to begin creating unique watch experiences to coincide with the release in early 2015. There was an unnecessarily large recap done by Craig Federighi for iOS 8 and OS X Yosemite. Various highlighted features such as Health, Continuity, HandOff, iCloud Drive, as well as improvements in iWork and other stock apps were showcased. This was followed by the reveal that OS X Yosemite will be available to all users as a free download later today. iOS 8.1 will be released on Monday, October 20 with Apple Pay. Additional features include iCloud Photo, the return of the Camera Roll, and other minor improvements. Tim Cook returned to talk about the iPad. To date, over 225 million iPads have been sold. It has become the fastest and most integrated product in history. The iPad Air 2 was unveiled in a short teaser video of a pencil being cut by a laser. This was in reference to the ad that introduced the iPad Air last year. 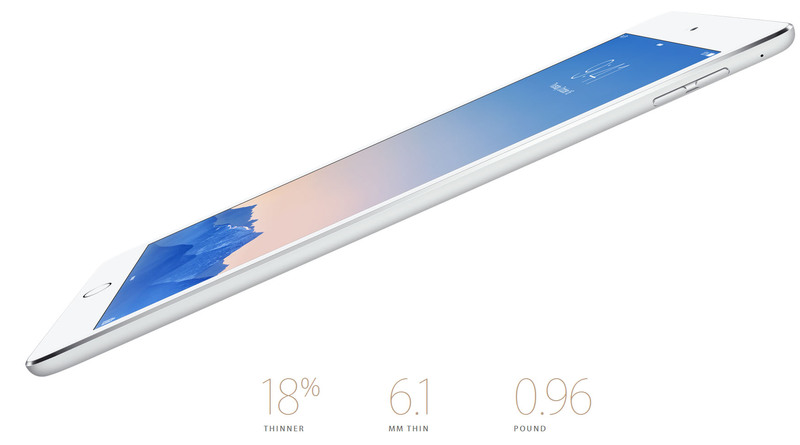 It highlighted the new slim profile of the iPad Air 2 at 6.1mm. The mute switch has been removed to assist in achieving this slim profile. A second generation 64-bit A8X processor is at the core of this device. It offers a 40% performance boost from the iPad Air and a stunning 180x graphics improvement from the original iPad. The camera was upgraded to 8MP with 1080p video, similar to the iPhone. Other new additions are panorama and burst photos, as well as time lapse and slow-mo videos. Wifi AC is included for 3x faster wireless speeds than last generation. Touch ID is also integrated for unlocks and purchases. Apple Pay is supported for online purchases with the use of Touch ID, but the iPad Air 2 does not have NFC. This means they cannot be used for Apple Pay in retail locations. A photo editing demo was performed using Pixelmator, followed by a video editing app titled Replay. A Gold version is now available alongside Silver and Space Grey. The final update are the new storage options that were introduced with the iPhone 6. The 32GB option has been replaced with 64GB at the same price. The iPad Mini 3 was quickly slipped in at the end of the segment, receiving little updates. It now features a Touch ID sensor and the new storage configurations. The A7 processor, camera, Wifi N, design, and display remain the same as the previous iPad Mini. The Retina iPad Mini is now priced $100 less, and the first generation iPad Mini is still being sold at $249. A brand new Retina iMac highlighted the entire event. This new resolution is set at 5120×2880, or 5K. It has 7x more pixels than a 1080p display, and 67% more than 4K. There was a long list of new technologies created to sustain a display this advanced. The team was able to reduce energy consumption by 30% even with all of these new additions. The base model starts at $2,499 ($2,749 Canadian) for a 3.5GHz quad-core i5, 8GB RAM, 1TB Fusion drive, and an AMD Radeon R9 M290X 2GB video card. Customization options include a 4.0GHz i7, 32GB RAM, 3TB Fusion drive, and an AMD Radeon R9 M295X 4GB video card, totalling up to $3,749 ($4,015 Canadian). Apple has posted a 5k image to give customers an idea of how big this resolution is. I viewed it on my 4K Samsung monitor, and there’s still a lot of room to scroll. These are set to be the best displays ever created. The last surprise for the event was a small update to the Mac Mini. As hinted in our Event Report earlier this week, the Mac Mini was predicted to receive a full overhaul. Apple has kept the same design but fully upgraded the internals. With a new starting price at $499 ($549 Canadian), it offers a 1.4GHz dual-core i5, 4GB RAM, 500GB hard drive, and Intel HD 5000 graphics. Other new additions include Wifi AC, Thunderbolt 2, and 4K support. Configurations can be made up to a 3.0GHz i7 processor, 16GB RAM, and SSD storage. A dedicated graphics card is not available in any version. Both of these new computers are available starting today. Tim Cook closed out the event with a heartwarming thank you to all of the teams involved in creating these products. With the Apple Watch set to be the first major launch of 2015, it’s set to be another record year. The event is already available to watch on demand here.